Philips Avent orthodontic, collapsible and symmetrical teats reflect the natural development of your baby's palate, teeth and gums. 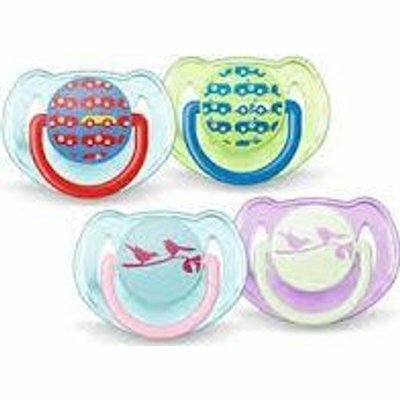 All Philips Avent pacifiers are made of silicone and are tasteless and odourless. Colours are subject to change. Philips Avent flat, drop-shaped symmetrical teats respect the natural development of your baby's palate, teeth and gums, even if the soother ends up upside down in the mouth. The Philips Avent silicone teat is taste- and odour-free so it's more likely to be accepted by your baby. The silicone is smooth, transparent and easy to clean, and it doesn't get sticky. The teat is strong and long-lasting, and won't become misshapen or discoloured over time. For easy removal of the Philips Avent soother at any time. Helps to comfort your baby.